Develop technologies, delivery tools, platforms, and systems to enable the reuse of intelligent content across multiple channels and modes. Marketing automation, adaptive content for personalization, and AI-driven multi-channel delivery requires structure, semantics, and systems to support the new shape of content and content publishing. Nailing customer experience has never been more important. According to Gartner’s Customer Contact Council, users experiencing low effort in achieving their goals were 23 times more likely to repurchase and 22 times more likely to spend more money on second purchases. Inversely those customers required to exert high effort to achieve their goals were 81 times more likely to exhibit negative word of mouth. In short, we must develop frictionless customer experiences to win and keep customers. Customer Experience Technology Consulting — [A]Ⓡ helps select, build and integrate the ideal customer experience platform and technologies customized to organizational needs. Customer Experience Platform Development and Implementation — Implementation of CEM/CMS platforms and management of the complexity of content migration, syndication and targeting across all channels. Enterprise Software Integration — Enterprise integration of business intelligence and search tools, ERP & CRM applications, knowledge management, emerging cognitive and semantic services, line of business applications, and custom web services development that moves content across silos, enrichs and connects it, and publishes content out to impact the customer experience at the CEM layer. Marketing Technology Selection and Planning — Analysis of needs for martech stack software and planning for logical selection cycles that incorporate key integration considerations. Armed with an intelligent selection, [A] organizes and implements the right mix of marketing technologies, connects channels, automates engagement, integrates APIs and web services, and enables content reuse across channels. User Experience Design and Interactive Content Development — Design and delivery of personalized customer journeys and engagement paths across all digital touch points, from website to mobile, to robots like Google, Siri, and Corona, to native apps. Multichannel and Mobile Content Enablement — Multi-platform development, mobile commerce and integration with CMS/CEM/CRM software and content APIs. [A]Ⓡ provides organizations with the content platforms, structure, expertise, design knowledge and tactical planning needed to engage audiences across all digital touchpoints. [A]Ⓡ is a distributed, private, professional services firm that helps smart organizations get smarter through intelligent use of valuable content assets. Complex organizations use [A] to compete in a multichannel, multimodal, AI-driven world. [A] clients and agency partners employ content engineering to help bridge the integration gap between content strategy, the CEM and customer experience technologies and value [A]'s proven methodologies for content valuation. [A] offers strategic support for building content intelligence practices into organizations and tactical services, including content engineering, and CEM platform technologies, integration, training, custom development and web analytics. 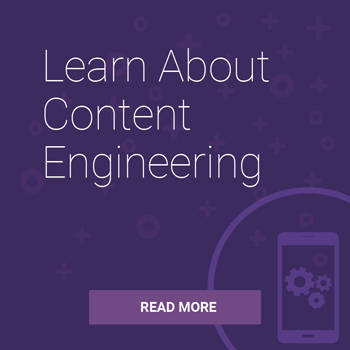 [A]'s content engineers specialize in strategy, integration, management, support and training for the leading Content Management System (CMS) and Customer Experience Management (CEM) technology and platforms, including Kentico and Sitecore. Contact [A] to learn more about how intelligent content strategy, design and engineering can benefit your organization.